It is often said that a product is only as good as how well it is used. Nothing is truer than when it comes to implementing Computerized Maintenance Management Software (CMMS) systems. While today’s CMMSs have become a household name in the facility management world, its growing appeal to companies spanning across a broad range of industry, corporate and retail sectors is largely due to the results it produces. The key to achieving these results begins with successful CMMS software implementation. Here, I’ll identify the key factors in that process. To fully understand the need for proper CMMS implementation, having some background knowledge on the system is a good starting point. From a product standpoint, the key drawing card for businesses considering making the shift from manual maintenance approaches to a CMMS is offering business owners an efficient and cost effective solution to streamlining their maintenance management operations. This means that automated systems must surpass “pencil and paper” approaches by saving business owners time, energy and resources and by also adapting to changes in their company’s size, structure and technology. Today’s CMMSs are powerful and robust systems that are capable of analyzing thousands of data points and instantly providing an overall view of facility operations or alternatively, zeroing in on the status of a single piece of equipment. Along with mobile access as well as voice command and imaging capabilities, CMMS solutions can also create a customized preventive maintenance plan that conserves the life span of equipment while at the same time saves time, resources and money because unexpected and costly breakdowns that interfere with production cycles can be prevented. For these reasons as well as a range in options and pricing structures, maintenance management systems have become the choice maintenance management solution. Check out our article on How a CMMS Can Help Improve Relationships With Vendors to learn more. Developing a Game Plan – A maintenance management system is a huge investment not only financially but also in terms of time and resources spent. Therefore, the first step in having a successful CMMS software implementation is ensuring that all staff members are fully on board with adopting an automated maintenance management approach. Next, before a final purchase decision is made, it is important to obtain input from those who will be using the system regarding the features that will be the best fit for company’s needs, challenges and goals. When it comes to goals, these may include any or all of the following: reducing reactive or corrective maintenance costs, decreasing equipment downtime or reducing technician utilization. Finally, the maintenance team should decide how the CMMS should be customized to match the company’s needs. For example, team members need to identify the equipment, inventory and users that will be included in the system database. To gain faster access to CMMS benefits, maintenance managers may choose a stepwise approach to implementation. This approach involves first adding the most costly or most essential assets first and then overtime, adding less essential ones. The choices made at this stage will have a huge bearing on the scope of the overall CMMS system operation as well as how long and involved the data integration phase of implementation will take across time. The main point to be considered is finding a maintenance system that will provide the right fit for a company across time. Who Will Have Access? – Determining the scope and nature of user access is an important part of CMMS implementation. Since maintenance staff vary in terms of their roles, responsibilities and even site locations, it is important to think about how to assign different levels of access based on these variables. Many CMMS systems make it possible for maintenance managers to allocate different levels of access to the CMMS software so that some users can have full system access while others do not. Maintenance managers need to consider these variables when assigning user access during the CMMS software implementation process. Creating a Preventive Maintenance (PM) Program – Without a doubt, a customizable PM program is the most valued feature of CMMSs. This feature alone accounts for the greatest time and cost savings for business owners. For these reasons and because no two companies are alike, a PM program must be configured to meet a company’s unique operational needs. Given its important function, it also forms a central part of CMMS software implementation. Therefore, it should not be minimized. The steps involved in setting up a PM program include reviewing equipment repair histories and a company’s production cycle. In doing so, equipment can be prioritized based on age and/or repair frequency. PM schedules can be set according to low usage times and inspection dates or based on usage or site locations. CMMSs offer the benefit of creating multiple PM schedules that can be run simultaneously. Finally, by reviewing CMMS generated reports, adjustments can be made to PM schedules in order to improve efficiency even more. Launching a CMMS and Beyond – Onboarding and follow up tech support are probably the most downplayed and overlooked aspects of CMMS software implementation. In spite of all the efforts just described, a powerful CMMS system could be rendered useless without them. As suggested at the start, a maintenance management system’s effectiveness relies heavily on consistent and appropriate use by maintenance staff. Having onboarding and ongoing tech support in place are two ways of ensuring that the CMMS is doing the job it is designed to do. Apart from ensuring proper system use, onboarding can help reluctant users to feel more comfortable when transitioning to an automated system. Reliable tech support can provide new users with solutions to problems if and when they arise. Utilizing these resources increases the likelihood that a CMMS software will be used routinely and appropriately. 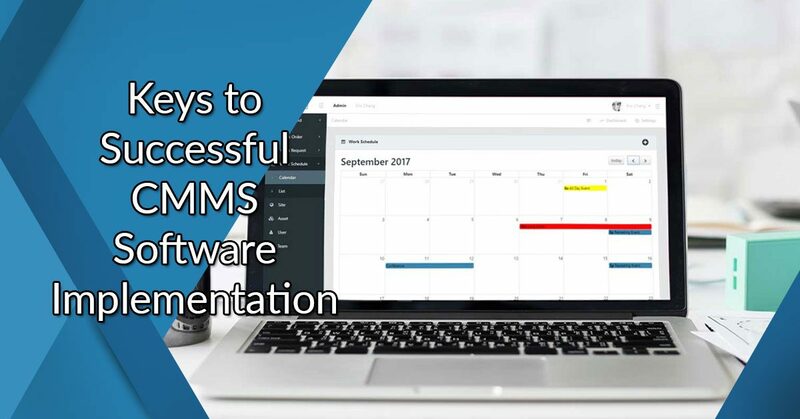 Along with other implementation supports previously mentioned, most CMMS vendors include in their system packages a variety of onboarding and ongoing support resources for their customers. These supports are aimed at assisting users in appropriate system usage at the start as well as across time. They are available in a variety of formats and at different price points including online manuals, videos, email, chat and webinar recordings as well as telephone support.